We have a 10 month old female pit. She is usually very friendly and affectionate. We have had her since she was 5 weeks old. She has gone to the dog park since she was 8 weeks. She loves other dogs and people. We have recently had to move in with my parents. She has 5 acres to run around on and another dog to play with. She is mostly an inside dog. Where we lived before, we could not have fences, so we went with her when she went outside. She has never been teased, hit or abused. She is spoiled rotten and usually very sweet. Lately, she has been aggressive with my 12 year old son. She gets a "look" about her and then goes after him. She growls and tries to jump on him. I have been able to stop her. However, last night, she followed him into a room, jumped up on the bed and bit him. She drew blood and one puncture is fairly deep. She is usually very close to him. He spends a lot of time with her playing fetch and chase for the ball. She sleeps with him every night. She is more affectionate with him than anybody else. He is very frightened of her now. She is a huge part of our family but I don't know what to do at this point. Please help!!! Any suggestions??? to the vet ASAP. Explain what's happening and insist on a thorough work-up. As I read your description of the incident with your son, it sounds entirely unprovoked. Assuming he is a dog-savvy kid who knows when to give an animal its space, to not bother it when it's eating or sleeping, etc, makes the incident all the more perplexing. I mention it because some children unwittingly (not intending to be mean) do things that dogs don't like. But, that doesn't seem to be the case with what you've described about your son. Your recent move to live with your parents who apparently also have a dog may have caused her to feel insecure. Structure is important to dogs. Some more so than others. That's not an excuse. Just an observation. Any time a dog bites a human without provocation, it's a serious thing. If there's no medical basis for her behavior, then I strongly recommend you get a professional involved--preferably a behaviorist or a trainer who will come to your home and observe your girl and her interactions with each of you in her natural environment. Until you get to the bottom of this, I wouldn't allow your dog to continue sleeping with your son. It's understandable that he would be wary of her--especially since she went out of her way (followed him into his room) to bite him. For the time being, I think an adult needs to be available to intervene if necessary whenever the two of them together. Good luck. I do hope you'll write back and let us know how things are going. If there's nothing medically wrong with the dog, you should seriously not allow your son near her, who knows what he's been doing to her to make her aggressive. Otherwise you should put her down so she doesn't end up attacking your son or killing someone and then making the ENTIRE BREED look bad! When a dog attacks a person it should be put down. Sorry, it's really sad but if my dog bite my child and acted aggressive I would have to put him to sleep (if there wasn't a medical reason, etc). When i was 13 i was hugging my dog and telling her how pretty she was...i got over exited and held onto her neck toooo tight ...like playing... And when my dog had enough, she bit my face....yes, she drew blood and it was painful but then she did the doggy licky thing when they feel "guilty". The thing is that what happened was totally my fault!!! I was left alone with the dog and we musnt forget that as sweet and loyal as they are...they're still animals!!! We need to respect that. Do NOT leave your son with her unattended! Please don't leave her with your son when you are not with them, very close by. It is strange that a previously loving, attentive, calm dog would suddenly snap at her favorite person. The above stress may EXPLAIN some of it, but will not EXCUSE the behaviour. Get her checked by your Vet. Has she had any obedience training? That may help you communicate more clearly with her. Spend some extra time with her - one-on-one so she knows she is still your #1 Dog. While you are WITH them, let your son play fetch or something (distance/fun) with her, without endangering him. Watch/gauge the interaction CLOSELY! If you see any indication of something amiss, you will need to keep her on a short leash or crate her until you can figure out "what's up!" As a parent who has raised two kids with several Pits in the house - I can tell you that you protect your kiddo FIRST and worry about the pooch SECOND. At one point, we rescued a dog who turned out to be very aggressive - and she ended up being re-homed with a couple who had no kids - with a very clear discussion about the problems we had encountered. She was a Weimaraner, and threatened three people in our household... She was quickly *Gone* with no regrets. 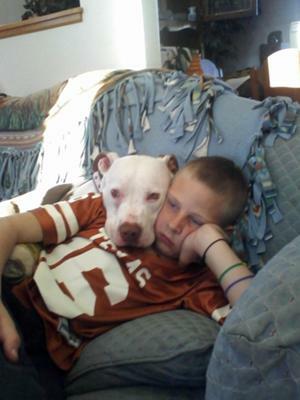 I have 2 Pitbulls of my own, both are like my own children. My boyfriend has 2 kids 7 and 9, who have been around both of the dog thier whole life. When we got our dogs as puppies we emmediately began a process of obedience that shows them who is the BOSS of the pack: When we fed them we would sit close and periodically reach for the food, if they growld or showed agression they got a stern NO, and and we'd pull the food away until they calmed down: when we played with them we would hug and hold them in a way that a kid would, the ways that typically "aggravate" a dog, again, if there was aggression they got a stern NO and and a prolonged hug:different things like that to show them how we want them to be have and that this behaveor isn't ok with us. Now my 10 month old nephew can play toys arpound them while they are eating without the dogs feeling uncomfortable, and every child that is around them can play like a child without the result of an attack. This may sound hatefull to our animals but these dogs are outgoing and very willing to please their owner WILL be the BOSS.Since they have learned we are the boss, they are very willing and excited to listen and make us happy. Our vet has told us he is very pleased with the attitudes of our 2 family members. Just as kids need a boss, so do your dogs, this is why we only spoil our dogs on the accasion that they have been very good in different situations and they know exactly why they are being rewarded. I have a 11 month old female that we purchased from a breeder when she was 8 weeks old. She is a wonderful pup but consistantly goes after my 8 year old daughters friends. I have a 16 and 13 year old and she never acknowledges their company but as soon as my youngest daughters friends walk in the door she is literally going after them. I got on the web tonight because it has happend again. I do not want my daughters friends to be scared to come over and i never want to worry about my dog attacking a child. I would never forgive myself. Any advice or imput would be greatly appreciated. Bella has never been aggressive towards anyone but little kids. She has never been hit,or mistreated by the children.